Place all items in a glass pyrex or baking pan and bake for about 30 minutes at 350 degrees. 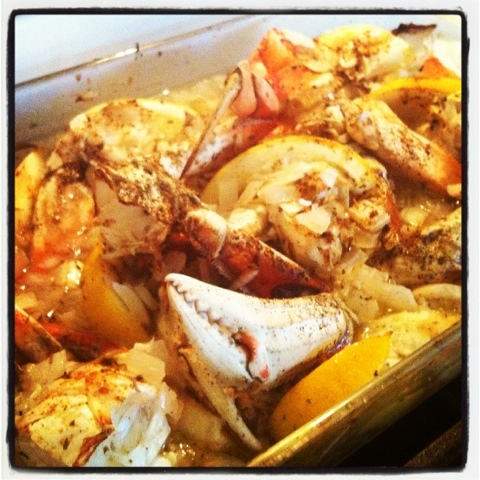 You can tell when it’s done, the crab meat is white, the lemons cooked and the sauce bubbling. You should then try my crab dipping sauce, it’s too good and super easy. Take the juice with onions in it from the pan, add some butter and microwave that for a minute, then add Parmesan Cheese to thicken it up. OMG, it’s so good – I don’t know one person that does not like it. Looks good Beks! Hope your NYE went well! Laine.